By Azzief Khaliq in Startups. Updated on November 19, 2017 . Videos are an important part of marketing, and may just be one of the best ways to attract attention to your business, startup or crowdfunding initiative. But making a video that’s good enough to attract potential customers or backers is easier said than done. Coming up with an attractive video requires some level of skill, talent and expertise. If you’re just starting out, you probably don’t have the time to teach yourself, and don’t have the budget to hire professionals to do it for you. If this sounds like you, worry no more; say hello to Videolean. 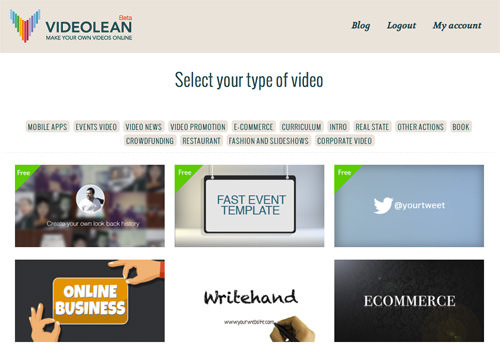 Videolean is a service, currently in beta, that helps you create short promotional videos for your business without needing any video editing skills or having to record any footage yourself. Just choose a template, fill in the required information and get an eye-catching video in no time. Interested? Read on. 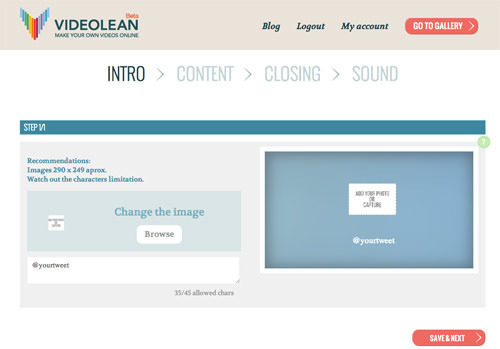 You can use Videolean without registering or logging in, but if you want to keep track of all your videos then you’ll want to log in. You can create a new account or login using your Facebook account. After logging in, you can start creating videos. Click on either the Start or Go To Gallery buttons. You’ll be taken to Videolean’s list of templates. You can either browse the whole list or browse by category. 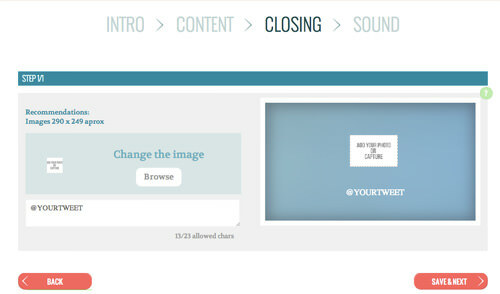 Once you’ve found a template you like, just mouse over it and click on the Make your video button in the pop-up. The pop-up also has a video preview of the template, so you can see how it looks like. Videolean’s video creation process differs depending on the type of video you want to make. But the process is fundamentally similar: you pick a template, fill in information and upload any required images, while Videolean will take care of the heavy lifting, including rendering the actual video. 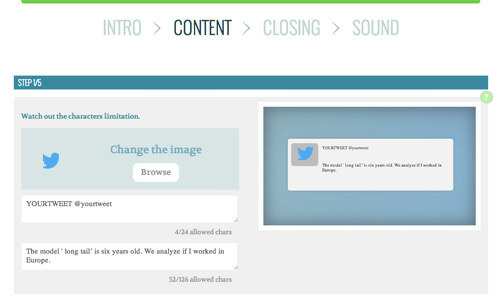 Here’s a quick run-through of the process with a tweet roundup template. First, you start off with your video’s introduction. Usually, this is where you upload your company or website’s logo. In the case of this template, this is also where you include your Twitter handle. Then, you move on to the content of your video. This differs from template to template; in this case, the content is a selection of five recent tweets that you want to show off in the video. Once you’re satisfied with the content, you move on to the closing segment of the video; here, it’s just the intro segment repeated, to remind viewers of your logo and Twitter handle. The final step for all templates is choosing your video’s soundtrack. 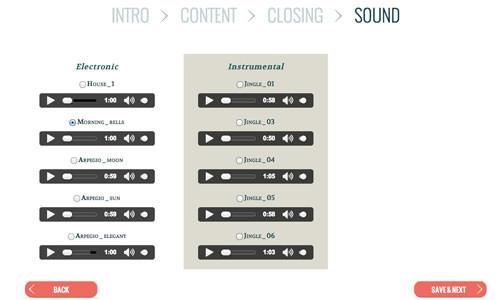 Videolean lets you choose from a few different musical tracks, both electronic and instrumental. They’re perfect for adding that finishing touch to your video. 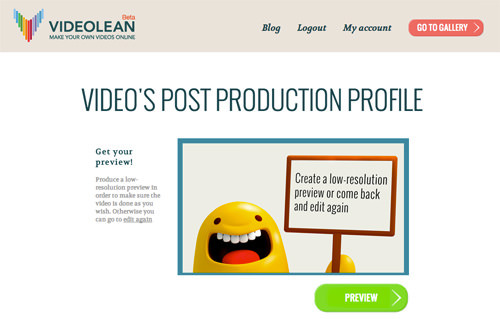 After you select a soundtrack and press Save & Exit, you’ll be taken to what Videolean calls the Post Production Profile. This is where you can have Videolean render a low-quality preview and edit your video’s details such as title and description. This is also where you can download the full HD version for uploading onto your own website or onto YouTube. If you’ve used one of the paid templates, this is also where you pay for the template. 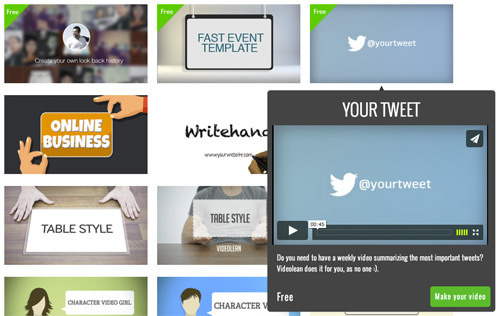 Videolean has a few free templates, but most of the templates are paid templates, ranging from US$15.00 to US$49.00. One good thing about Videolean’s model, though, is that you only have to pay at the end of the process. You aren’t charged for the video preview either, so you can put your video together and watch a preview before you decide whether the template is the right one for you. All in all, Videolean is a great tool if you’re looking for a quick and easy way to create an eye-catching video for your website or blog. Startups, especially, will appreciate the multiple templates and ease of use. Sure, most of the templates are paid, but if you don’t have the ability, time or equipment to create your own videos, the pricing doesn’t look too bad.